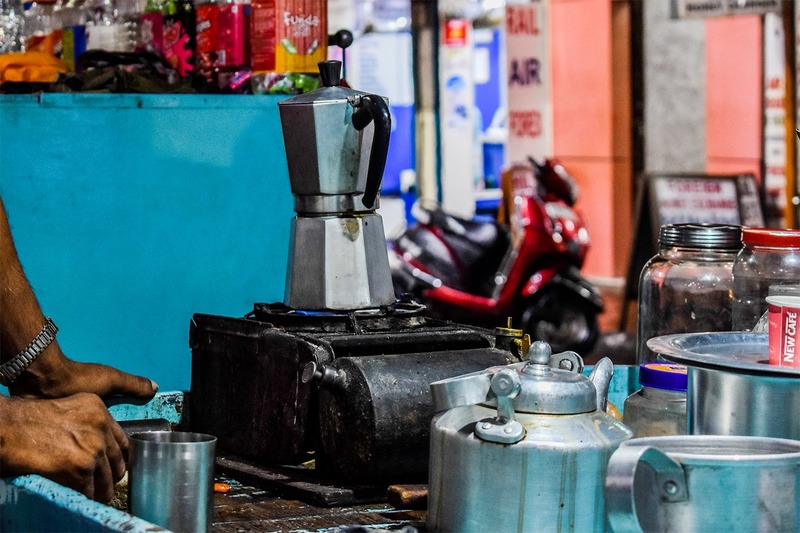 If you are a frequent visitor to Kolkata’s hippie hood Sudder Street, you may have spotted this chaiwala selling mocaccino and Americano from his street-side stall. This Sudder Street chaiwala’s got swag! He makes coffee in a mocha pot and brews it on a kerosene stove. Walk down a few yards from Spanish Cafe, towards New Market, and you’ll come across chaiwala Manikchand Mahato’s brightly painted street side stall on your right. Look out for the quirky name and the list of beverages he offers. It may be a street stall but his menu is as good as your neighbourhood cafe. Cafe Americano, cafe mocha, espresso, cappuccino, his coffee menu is extensive and fetches him a good deal of foreign customers from the hood (you’ll find them mostly during the winter months) who not only crowd his stall, but often supply him with accessories like his mocha pots and imported honey for his honey lemon ginger concoction. And get this – he sources his coffee from South India and grinds them himself to ensure good taste and quality. If you are a cha person, you can pick from herbal, green, black and masala. Combine that with a regular streetside breakfast spread of hot. buttered toast with sugar or eggs. And all of this within INR 60!